Since misalignment of the hip bones can affect the activities of daily living of an individual that has hip impingement or femoroacetabular impingement (FAI), initial treatment is geared towards managing the pain, which is the usual chief complaint. While treatment can be both surgical and non-surgical, nonsurgical ones are being instituted first. Therefore, if pain management do not relieve the pain, surgical management is the next step to be taken. Non-surgical treatments involve resting the affected part, modifying activities that may precipitate worsening of the condition, rehabilitation through physical therapy to strengthen the muscles, and anti-inflammatory drugs as well as pain medications. People with hip impingement or FAI are initially advised to follow certain changes in their activities’ frequency, duration, and intensity. These changes in activities are done to safeguard the integrity of the joint as well as to avoid moving it in a way that would be painful. In addition to this, structured exercises with physical therapists are also done to strengthen the muscles in the hip region which serve as the anchors and weight-bearers. These structured exercises promote hip’s range of motion as well as relieve stress on the injured cartilage. Lastly, pain medications are prescribed and administered to help manage the pain and inflammation. An example of this drug is ibuprofen. In some cases where non-invasive treatments are not effective, the doctor may opt to do surgery. While surgery does not promise 100 percent recovery from hip impingement or FAI, it is the best way to treat FAI as of now. It is the only way to relieve pain and improve function of the affected part. The surgery of choice is based on the extent of the affectation and severity of damage in the cartilage. For cases with less severe cartilage damage, surgery to be conducted involves surgical instrument to manipulate the anatomical flaw. This means reshaping the ends of the bones to be able to fit the two perfectly. The most common site of this surgery is at the outside edge of the socket. Another surgery is called microfracture. In this technique, the damaged cartilage is cut. Another approach is to drill holes into the damaged part. Both of these approaches are geared towards stimulating cartilage growth. However, microfracture is not frequently used. There is also a new approach which utilizes blood parts to stimulate growth of cartilage. 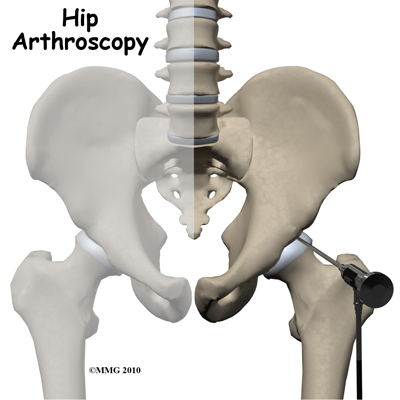 The typical hip impingement or FAI surgery is done through arthroscopy. In this surgery, a lighted scope called arthroscope with a camera on its head is inserted into a button-size incision to view the internal environment of the affected hip. This surgery is done on an outpatient basis. Therefore, patients can go home after once stable after few hours of monitoring. During arthroscopy, any frayed cartilages are repaired, bony rims are trimmed, and bumps are shaved. On the other hand, for some severe cases, a larger incision is required and an open surgery is done. The rule of thumb in hip impingement surgical treatment is the earlier a person subjects himself to surgery, the higher the chances of his complete recovery. Our specialists provide the best orthopedic and medical care available. Contact our sports medicine specialists today to schedule an evaluation.